Pattern in English. Both written description and charts. Difficulty: Adventurous beginner. Both charts and written pattern included. 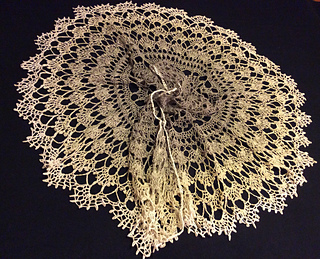 The pattern uses US crochet terms. UK crochet terms are included in the key to symbols list. Yarn: Zitron Lifestyle, 169 yds (155 m)/50 g. You will need 8 balls of 50 g. Tester using Lifestyle used 7 balls and smaller crochet hook. Other yarn may be used, but the pattern works better for heavy weight yarn. Tester using heavy lace was not happy about the increases which rippled too much in her gauge, so use sock weight or heavier for best results! Shown in Järbo cotton yarn 8/4, 740 yds (676 m)/200 g, you will need 200g if working in this yarn. Hook: US J (6 mm) using Zitron Lifestyle. Or the hook size that gives you a fabric you like. Hook G (4 mm) was used for the Järbo cotton sample. 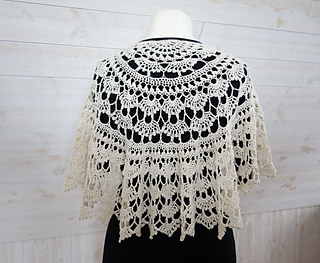 Size and shape: Not quite a full circle, it will fit nicely around shoulders without falling down. 21 ¾ inches (55 cm) deep/radius using Lifestyle. 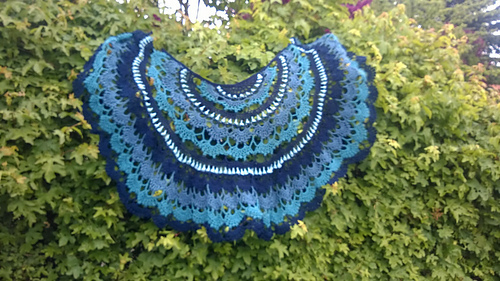 Some testers got a much bigger shawl by blocking it harder! 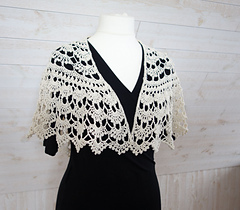 Construction: The shawl is worked in one piece from the center (neck) and out. Pattern includes a key to symbols in both English and Danish. Mønstret indeholder en symbolliste på dansk (sidste side).